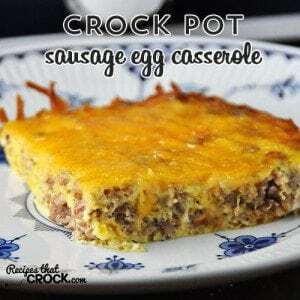 Crock Pot Sausage Egg Casserole - Recipes That Crock! 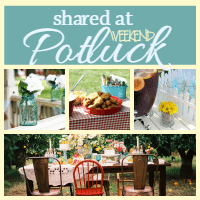 Do you ever have a favorite recipe that you want to try out in your crock pot? Well, that is exactly what happened with this Crock Pot Sausage Egg Casserole…and man is it good! A few years ago, Cris got Michael sausage from one of her farmer friends’ farms for Christmas. I thought the man was going to lose it. She is brilliant. It is the perfect gift for my food lovin’ husband. The meat is amazing and the seasoning is perfect! Ever since, someone has always made sure Michael got his sausage for Christmas. One of our favorite recipes to use a pound of this sausage for is our Cheesy Sausage Egg Skillet. So as I was trying to think of what to make this week, I was thinking about some of our favorite recipes, and just knew I wanted to try this out in the crock pot. So it is a wee bit different since you aren’t going to be breaking up the eggs up while you cook them, but the flavors of the eggs, cheese and sausage are still sure to please! 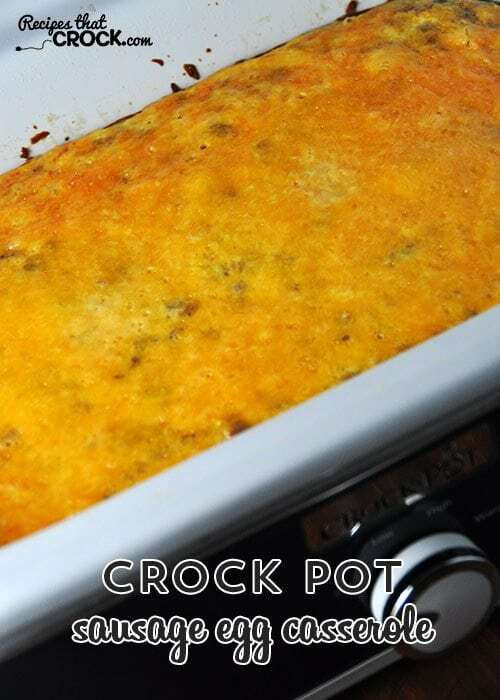 This Crock Pot Cheesy Sausage Egg Casserole is so flavorful and delicious! 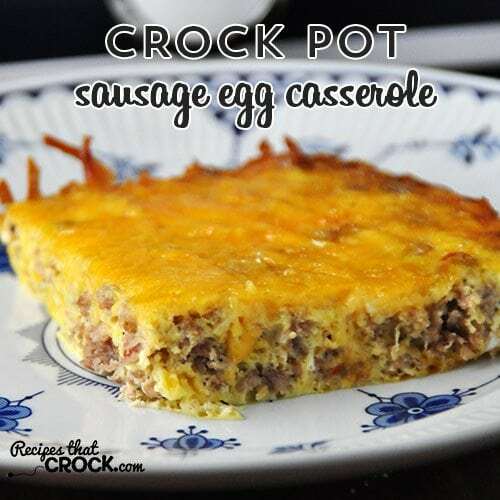 For this yummy Crock Pot Sausage Egg Casserole, I used my 9 x13 casserole slow cooker made by Crock Pot. If you don’t have one, I would use a 3-4 quart slow cooker since it isn’t a big recipe. Make sure you watch it the first time you cook it and adjust the cooking time as needed. Added onion powder and hot pepper Wonderful. Next I shall add herbs. Thanks!!! Super easy. I added a bag of the shredded hashbrows and a couple of drops of hot sauce to add a little extra. Awesome recipe for Christmas morning or New Years Day. Hello, Dot! Did you thaw the hashbrowns first? Thanks!